This morning, as well as seeing Maya on the Common (see photo below), I saw lots and lots of African monarch butterflies - mainly on exotic viper’s bugloss Echium vulgare flowers. 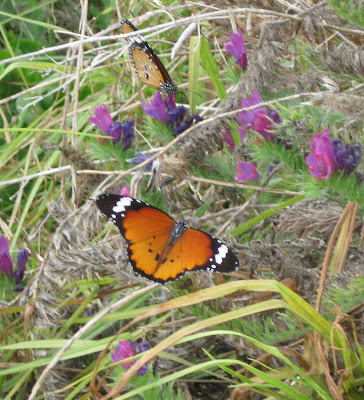 Appropriately, the African monarch, Danaus chrysippus, is a common butterfly. It is poisonous as its leisurely flight indicates, and lays its eggs on various asclepiads (Apocynaceae) from which it must get its poison. 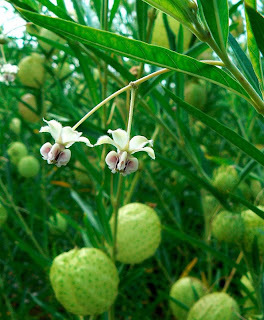 The plant it seems to favour most is Gomphocarpus fruticosus (formerly Asclepias fruticosa), commonly known as milkweed, wild cotton, tontelbos, wildekapok, tennis ball bush and swan plant. It is toxic as it contains a heart glycoside and occurs in permanent and seasonal streams, flood plains and disturbed areas from the Cape Peninsula northwards throughout southern Africa and further north.